We are still feeling the sting of last Friday night's game and the Clemson Tigers loss. It's not fun to watch your players fight injuries and eventually lose to a team that you never thought would be a threat. However, we are ALL IN - win or lose - and we know the team is getting some much needed rest this weekend as they prepare to take on Georgia Tech in Death Valley next weekend. 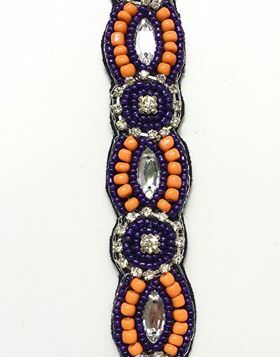 We hope today's post will cheer you up - it's a giveaway, and one lucky Clemson Girl will win a free Infinity Headbands orange and purple, beaded headband - called the 'Lindsay' headband. 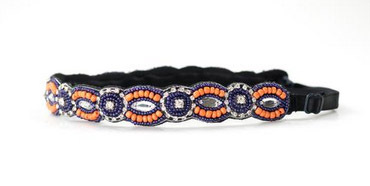 This headband is a great accessory for your gameday outfit, and very practical for a gameday hairday. The unique thing about this headband that you will love is the detachable and adjustable elastic. 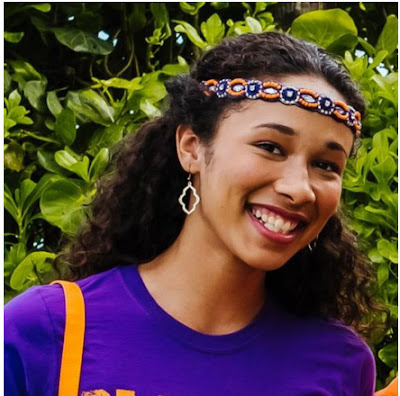 This ensures a comfortable fit and it will not slip off of your head while you jump around and cheer on the Clemson Tigers. 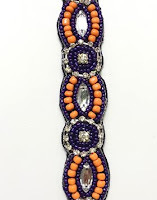 The beads and beadwork is of the highest quality too. 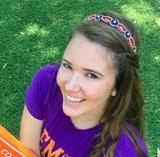 For a limited time, Infinity Headbands has generously offered Clemson Girls 20% off of their Infinity Headbands purchase - just enter coupon code CLEMSON at checkout. Please note that any info you submit in the giveaway for your entries will not be shared (your email! ), but only be used to contact you if you're the winner. The giveaway will end Friday at midnight (Eastern Time). We will randomly draw a winner and contact the winner by email. The winner has 72 hours to reply to our email to claim their prize, or we will draw a new winner. Special thanks to Infinity Headbands for helping to cheer us all up after last weekend with this fun giveaway! We are still feeling the sting of last Friday night's game and the Clemson Tigers loss. It's not fun to watch your players fight injuries and eventually lose to a team that you never thought would be a threat. We are still feeling the sting of last Friday night's game and the Clemson Tigers loss. It's not fun to watch your players fight injuries and eventually lose to a team that you never thought would be a threat. We are still feeling the sting of last Friday night's game and the Clemson Tigers loss. It's not fun to watch your players fight injuries and eventually lose to a team that you never thought would be a threat. Here we are with some more useful stuff that are Providing the all Microsoft Customer Support for the world wide users.